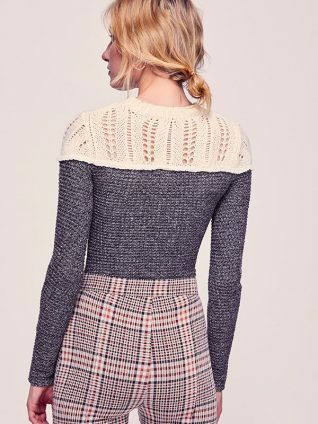 Free People “Snowflake Swit Top” – a very unique charcoal grey knitted top featuring crochet-like sweater design at neckline, long sleeves, rounded hemline, stretchy. Wear it as a top or as a pullover. Fits true to size. One of a kind style, indeed!